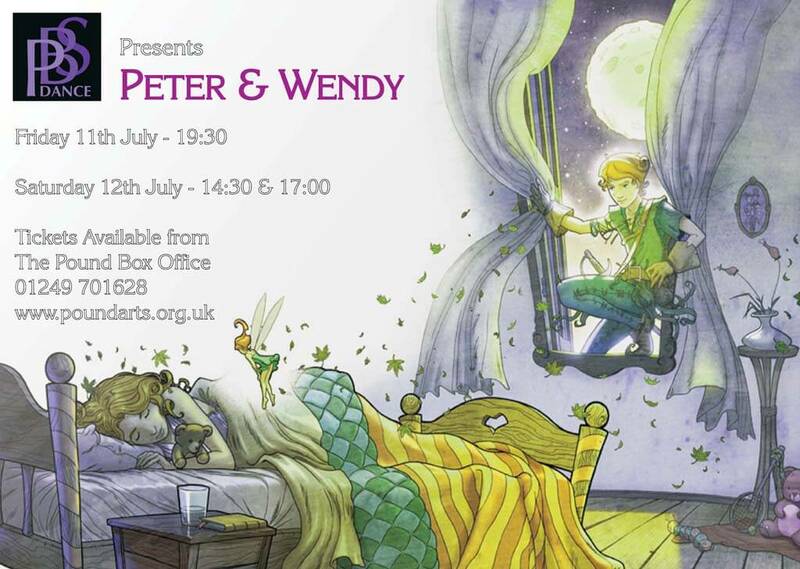 Students in the Wednesday Modern & Tap classes will start working towards a performance of Peter & Wendy on Friday 11th & Saturday 12th July in The Pound’s own theatre space. Students will need to be at the Pound on Friday 11th July at 18:00 to prepare for a 19:30 performance. Students will need to arrive at the Pound on Saturday 12th July at 13:00 to prepare for a 14:30 performance and remain at the Pound for a second performance at 17:00. The Show will be approximately one hour with a twenty minute interval but this will be confirmed nearer the time. The technical rehearsal will take place on Wednesday 9th July over the usual lesson times and you will be notified if your child’s class time may vary on that day. Parents can leave their child/children for the duration of the preparation and the performances and collect them afterwards. Please talk to me about any concerns leaving younger children for this period. More information on hair and makeup will follow when costumes have been organised. There will be a small fee of up to £10 for hire of a costume and an invoice for this will be sent out once the Permission Form has been returned. We are hoping that all the children will be able to participate, as it is good to have a goal to work towards and will be a fun and exciting experience. We have produced a number of well organised fun Shows over the years with some information of recent ones here on the website. Please return the form even if your child/children are unable to participate. Tickets available to purchase from The Pound’s box office. Nikki and Lucy’s creative choreography will not disappoint so do make sure that you book your seats in time and fill out the form to give permission for your child/children to be involved and return at their next lesson.